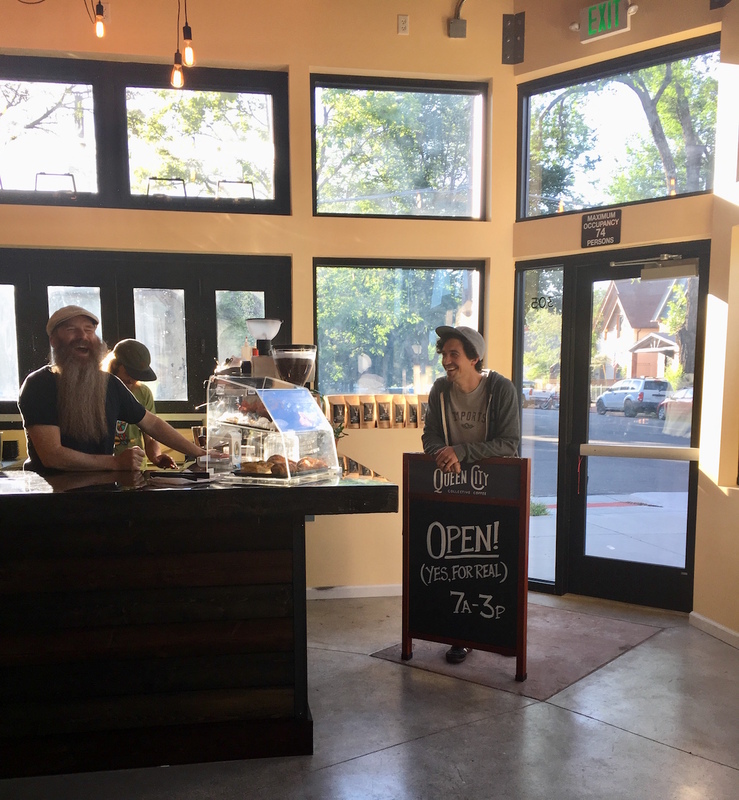 Queen City Collective Coffee in the space shared with Novel Strand Brewing Company at 305 W 1st Ave in Denver. All photos courtesy of Queen City Collective Coffee. As work continues on the combined production and retail brewery announced by beer company Novel Strand last year, its coffee partner in the space, Queen City Collective Coffee, opened for business last weekend. 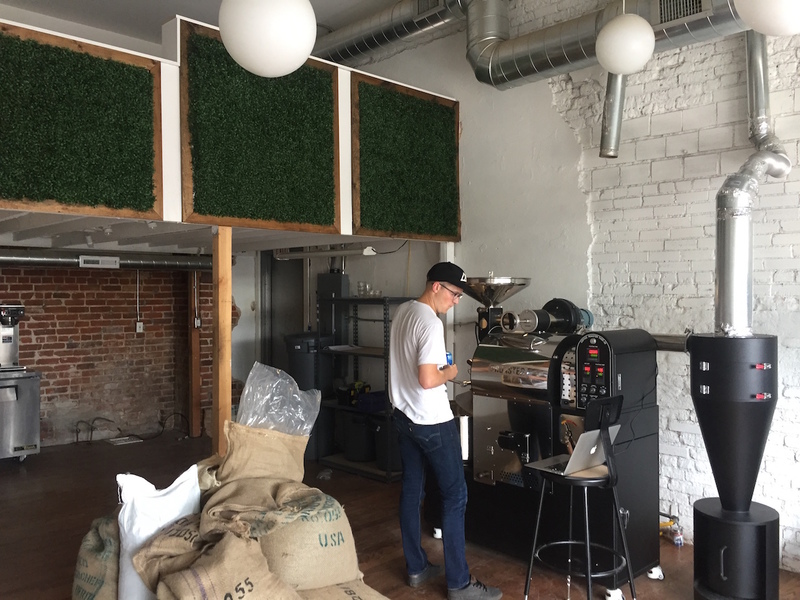 The new coffee bar constitutes the two-year-old Denver-based roasting company’s first retail location. The 1,000-square-foot shared retail area is attached to an approximately 800-square-foot brewery and will be operated by QCCC every day from 7a.m. to 3 p.m., after which Novel Strand will soon be taking over Thursdays through Sundays starting at 4 p.m. on weekdays and at noon on weekends. 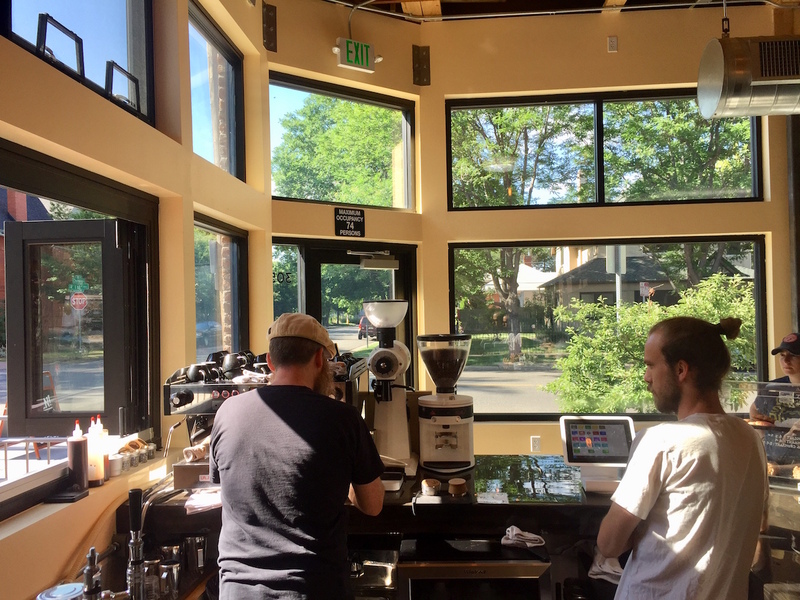 Queen City Co-Founder Scott Byington told Daily Coffee News that the two concepts will only serve simultaneously during some brief overlap midday on weekends, and will otherwise operate separately. Fortunately, the company’s 2-group La Marzocco Linea PB was ready for action on the bar alongside a Mahlkonig Peak for house espresso and an EK43 for single origins and for Fetco XTS batch brew. There’s also two taps for dispensing nitro cold brew and nitro tea. The cafe’s aesthetic takes on the genial and crafty spirit of the brewery, particularly influenced by the Novel Strand head brewer’s affection for Belgian culture, but it is also in sync with the historic character of the surrounding Baker neighborhood. That approach is one honed by years of development both in the roasting and the sourcing, the latter perhaps even more so. Brothers Eric and Scott Byington helped run the nonprofit Elias Fund, aimed at reducing poverty and empowering struggling communities in Zimbabwe, for roughly seven years, after which Scott Byington continued on in pursuit of a masters degree in rural and environmental sociology that found him back in southern Africa once again. These activities lead to connections with coffee farmers, including at the Hingakawa women’s coffee growers group in Rwanda. 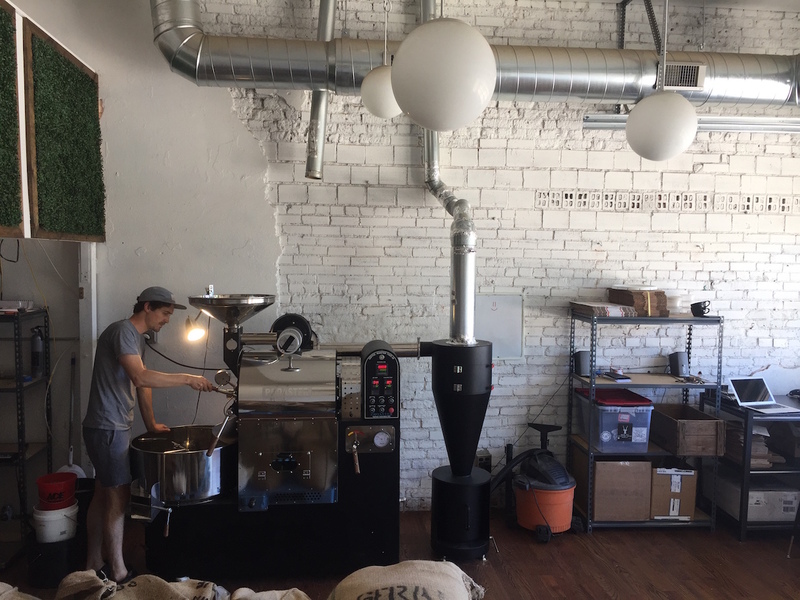 Meanwhile, younger brother Luke Byington amassed several years’ experience roasting coffee and assisting in the opening of new shops and facilities for Allegro Coffee Roasters. 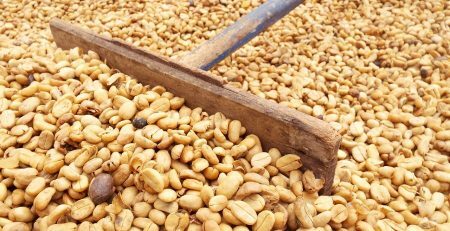 These parallel planes come together at QCCC, which has to date also grown into relationships with coffee growers in Colombia, Guatemala and Nicaragua. The roasting company is one with a strong social component, pursuing community and agricultural development projects in the locations where it also sources coffee. For example, after meeting with growers and responding specifically to their priorities, last season QCCC helped Hingakawa build new raised beds for drying coffee. This season they’re helping build a Hingakawa community center that will provide educational and childcare services, nutritional supplement distribution and other services aimed at being an all-around hub for the development of the community. The coffees yielded by these relationships are treated just as conscientiously on the company’s 10-kilo Proaster machine, which moved one month ago into the roasting facility recently outgrown by fellow Denver roaster MiddleState Coffee. Byington said that while the Queen City style tends to fall on the light-to-medium side in order to preserve as much origin-indicative cup character as possible, the company focuses its messaging more on the farm-direct nature rather than its roasting technique. 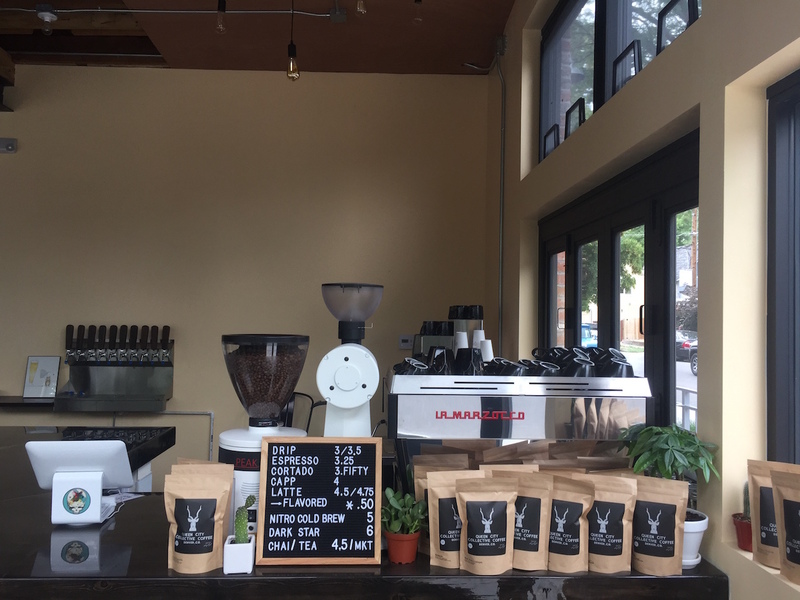 Now with more space for its roasting operation, Queen City Collective Coffee looks forward to growing it wholesale business, while at the same time formulating plans for its second retail outlet as well, although details on the latter development are not yet ready for announcement. QCCC is now serving at 305 West First Avenue in Denver.